Lavishly illustrated by clear line diagrams and photographs, Ward’s Anaesthetic Equipment is a highly accessible single source to aid understanding of the key principles behind equipment function and design. This sixth edition of the classic reference text on anaesthetic equipment is again extensively revised to reflect the very latest advances. 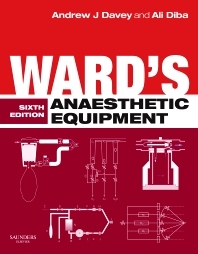 Ward’s is an invaluable resource for qualified anaesthetists, as well as essential reading for those in training or approaching examinations such as those of the Primary and Final Fellowship in the UK and Ireland. Trainees in Intensive Care Medicine, anaesthetic assistants, operating department practitioners, electronic and biomedical engineers in hospitals and manufacturers’ representatives will also benefit from this most trusted guide.